One day - maybe eight or 10 centuries ago - some people knelt on an expanse of rock and ground mesquite pods into meal in mortar holes etched in the stone. Those people, members of a civilization known today as the Hohokam, are long gone. But their bedrock mortars - or morteros - remain perfectly intact at a remote site in the Tortolita Mountains northwest of Tucson. 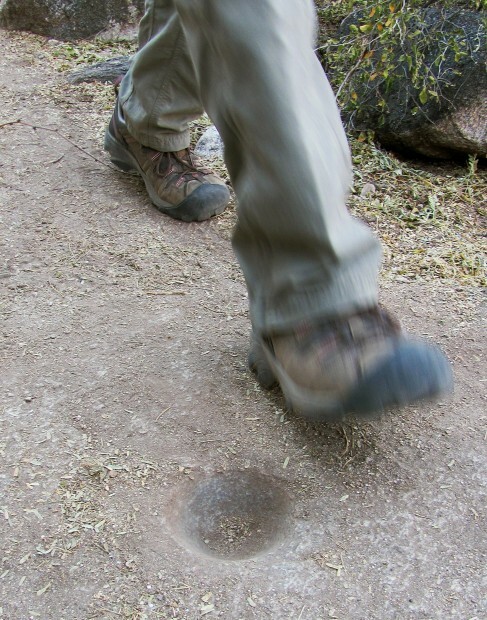 The Tortolita morteros, and hundreds of others in deserts and canyons around Tucson, amount to mini-archaeological sites for passing hikers. They are a hometown prehistoric treasure often overlooked by walkers bound for scenic canyons or soaring summits. "Bedrock mortars really are worthy of wonderment," said archaeologist Allen Dart, executive director of the Old Pueblo Archaeology Center and a principal investigator for the EcoPlan Associates Inc. consulting firm. "They lead us to speculate about how people used them and how they related to social practices." "There are probably thousands of them" around Tucson and Southern Arizona," said Dart, noting that he's seen some morteros up to 18 inches deep. "I know of several hundred of them in the Sierrita Mountains southwest of Tucson," he said. "There are also some in the Coyote Mountains southwest of Tucson. There are a lot of them in the Tucson Mountains, and some in the Rincon and Catalina mountains." Dart noted that another site, Pima County's Los Morteros Conservation Area, includes rock outcrops with dozens of bedrock mortars. The site is northeast of Silverbell Road and Linda Vista Boulevard. • The Ventana Canyon Trail, which begins at a signed trailhead at Loews Ventana Canyon resort, 7000 N. Resort Drive. • The Alamo Spring area along the Wild Burro Trail in the Tortolita Mountains. The trail begins at the Ritz-Carlton, Dove Mountain, 15000 N. Secret Springs Drive in Marana. Some morteros "go back to early Hohokam times around A.D. 500 and very likely to archaic times" before the Hohokam, Dart said, noting that others are more recent. He said prehistoric workers would use pestles made of stone or wood to pulverize the pods of mesquites and other plants in the mortar holes. "They would pulverize the stuff until it was about the consistency of corn meal," he said. "They could have used the meal to make little griddle cakes." Bedrock mortars are significant, Dart said, because "they represent a major food resource for prehistoric and historical people." But it's likely they also served another purpose: as social-networking sites. "People grouped around these things to work, so potentially they were sites for social interactions and support," Dart said. Because mortars are embedded in rock, they aren't especially vulnerable to damage. But people should avoid stepping on them or digging dirt out of them because they might have preserved prehistoric plant material that could be useful for study.